The Steel Warrior Greaves have a simple, yet very appealing design. They feature a smooth finish with small studs along the top and bottom edges. The Steel Warrior Greaves are crafted from 18 gauge steel and are sold as a pair. These Greaves attach to the leg by two leather straps and buckles. 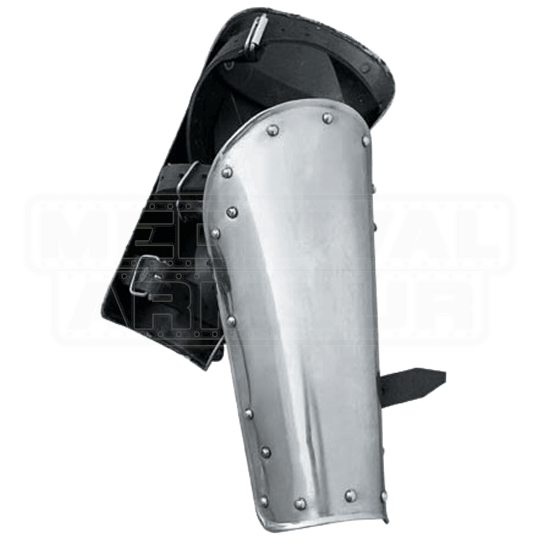 These greaves are great for Medieval Fairs, LARP events and most other Re-enactments. These are measurements of the armour only. These measurements do not include the straps or buckles. This will show you how much of your shin the greave will cover. Once I found a comfortable way to wear them (topmost strap resting higher than my boot tops), these were great to wear. They slid down at first, until i figured out the better way to wear them described above, and once I figured out how to wear them right they were barely noticeable by me as I ran through the woods. Happy with this purchase! Bought these to go with the matching bracers. Really great price. This is less than I could get the materials to make them. They come covered in protective oil, but it's easy enough to clean up. Then apply some more light oil in between uses to help protect against rust. I've using them for about a year now with only one tiny spot of rust. I made the mistake of getting the large instead of the medium. I'm 6'2". I wear foam pads over the knees for comfort, but with the medium I don't think I would need it. I get compliments on them at the LARP group. When I emailed to ask how to take care of them the reply was quick and helpful. One of the pins on the straps was already popped out once I received it. I can probably hammer it back in. The sizing was very difficult to sort out; measurements are listed accurately, but it would be helpful to know how those should fit or compare to an actual leg - I ordered mine too large. These do need some sort of padding to fit comfortably; the back is just leather straps riveted to metal. As mentioned, they are not rust resistant. That said, it's good quality construction and solid riveting, with thick leather straps of good leather.